Bring Cinco de Mayo into your home tonight with this crowd-pleasing Chicken and Cheese Quesadilla recipe. Be sure to serve up with some guacamole and Hiland Dairy’s All Natural Sour Cream…trust us, it will have your family saying ‘gracías’ in no time! Just don’t forget to print off our online coupon for 40¢ off any 16 ounce Sour Cream or Dip before you head to the store. Preheat the broiler. Grease a baking sheet. Toss the chicken with the fajita seasoning and then spread onto the baking sheet. Place under the broiler and cook until the chicken pieces are no longer pink in the center, about 5 minutes. Preheat the oven to 350°F. Heat the oil in a large saucepan over medium heat. Stir in the green bell peppers, red bell peppers, onion and chicken. Cook and stir until the vegetables have softened, about 10 minutes. Layer half of each tortilla with the chicken and vegetable mixture, then sprinkle with the cheddar cheese, bacon bits and Monterey Jack cheese. Fold the tortillas in half and place onto a baking sheet. Bake quesadillas in the preheated oven until the cheeses have melted, about 10 minutes. You’re in luck! 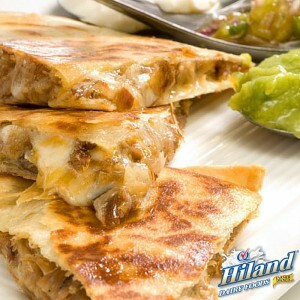 You can find a whole array of recipes on HilandDairy.com.